What a difference a day makes. 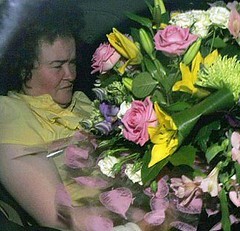 Susan Boyle was transported by ambulance today from her London hotel to a private health clinic, reportedly suffering exhaustion and some mental distress. I suspect the same thing would have happened had she won first place. The sudden and overwhelming celebrity was probably as enormous a burden as it was an opportunity. I hope she gets excellent care and recovers quickly. I’m sure Simon or someone is planning on having her record an album, and I’d bet it will secure her financial future. Update 2:47 pm MT: Voting is closed. And the winner is: Diversity. Top Three: Susan Boyle, Julian Smith and Diversity. Third place: Julian Smith. (He was terrific, you can watch his final performance here.) 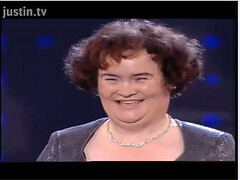 Second: Susan Boyle. She was totally gracious. She said, “The best won.” She smiled, laughed and raised her skirt and showed some leg.